Did you know ginormous, embellished pockets are the new cool? Simone Rocha brought unbridled glamour to the runway with her collection consisting of black taffeta coats, fake fur stoles, and furry bathrobe coats that were cleverly played with contrasting tie-belts. Slamming the ageist notions of the fashion industry, she put forth of a group of models who reigned in the 60s and 90s, all of who carried off her voluminous puff-sleeved Victorian aesthetic with the same fiery passion as the younger models. We liked how the militaristic overtone seemed to hint at an impending feminist war. Chalayan’s showcase was a languorous take on Greek folk costume that integrated cloaks, loose pants with protruding belts, and inbuilt waistcoats. The Jodhpur influences on long gray woolen pants amalgamated the two cultures with brilliant subtlety. There were robe dresses in blue and gray and one-shouldered gowns. Jackets with softly volumised arms and hidden inner sub-jackets were further testament to Chalayan’s expertise in bending fabric to his will. The glimmering palette of color enchanted the audience at Mary Katrantzou’s show as she presented row after row of a collection that was seemingly inspired by Disney’s Fantasia. Big shoulders, furs, and checked tweed transported us back to an era when fashion was grand and ostentatious. Katrantzou’s ode to the iconic Disney movie would’ve been incomplete without a nod to the Little Mermaid and the Little Centaur, which she pleasantly surprised all by including towards the end of her showcase. While Erdem’s style hasn’t been influenced by political events in the past, this season saw him present a gorgeous melding of English and Turkish culture. However, it was not only so he could allude to the displacement of millions of Syrian refugees into Turkey, but veers towards a more personal agenda. Erdem’s mother was English and his father was a Turkish chemical engineer and having lost both them a few years ago, he wanted to use this showcase to go back to his roots. The Turkish influences were grander in the form of necklines, pom-pom trims, and traditional embroideries; while the English traces like camel coats, florals and tea-dresses brought him back to familiar territory. Peter Pilotto heralded a new era of quality outerwear as patrons of the brand were treated to eclectic tweed parkas. The embroidered riding boots and the thick fringing on knitted coats and chunky sweaters lent a retro vibe to his ensembles. Finally, printed asymmetric-hemmed midi dresses and scarf necklines offered various styling options that ensure you look good in every option. All in all, it was a delightfully eccentric collection — one that we’d definitely like to see more of. Hindmarch’s pop collection saw models take to the runway in high shiny bloomers, Nordic knits and pastel cable-knit romper suits. The outerwear was presented in felt and wool, often paneled with grids of shearling. In her trademark style, bags were garlanded with leather paper chains, dragonflies, and leaves, while sliders and bags had furry eyes that made us sit up and take notice. Taking biker chic and turning it into something edgier, Versace’s models initially took to the ramp in body-hugging pants lined by silver zippers and cropped jackets in lightweight scuba material. This gave way to a spot of denim, followed by a rally of oxblood and finished off with athleisure. The humble pocket has put its days of being purely functional behind it. 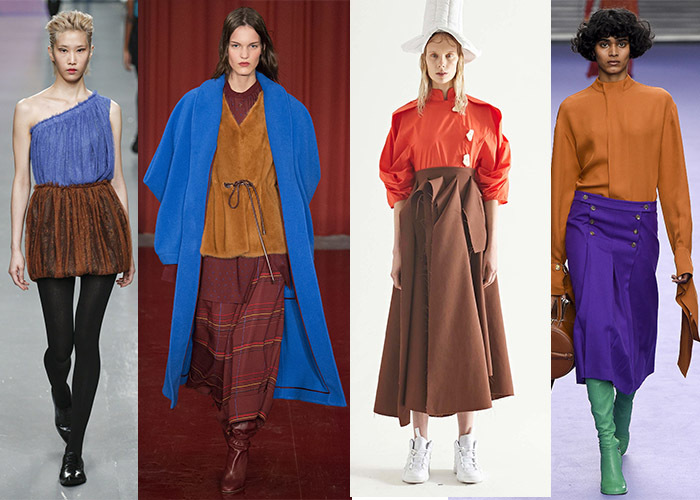 The new rule for pockets is: the bigger, the better. Embellishing them is also all the rage right now where you can add graphic motifs or fashion it to look like a sling bag. If you’re one to take sartorial risks, you could also opt for a garment where the upper half is literally two big pockets, as seen at J.W. Anderson. 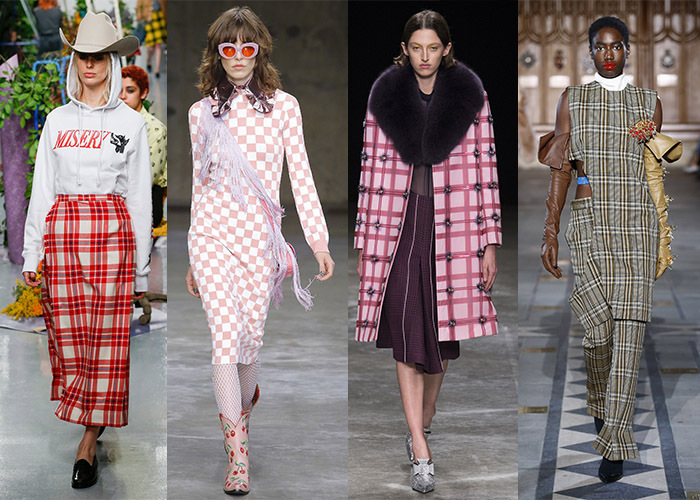 Checks made a seemingly endless appearance on the runway this year, where models paired skirts, bodycon dresses, and trenchcoats, all riddled with checks. Eschewing the age-old tradition of never going check-on-check, models at Toga sashayed in checkered separates which made us take notes for when we embark on our next shopping spree. 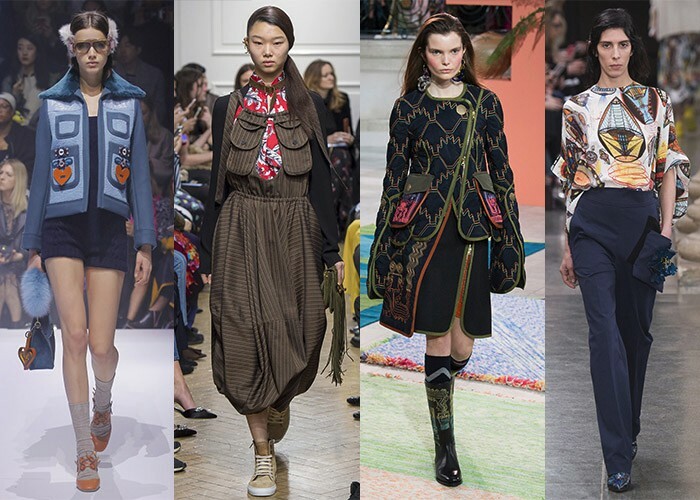 While monochromes and grays tend to rule London’s Fall/Winter runways, this year saw designers opt for cheerful tones that reeked of vitality and optimism, possibly alluding to the fact that the world could do with more of it in these dark times. 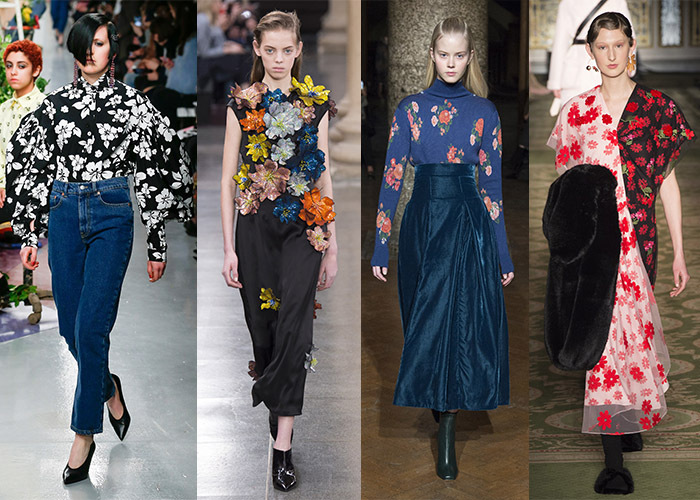 Exaggerated sleeves are the new cool kids on the block. 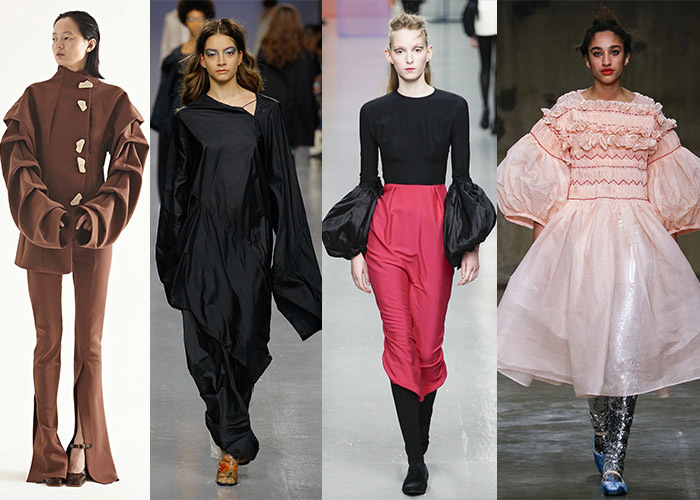 This season, the more bizarre your sleeves, the more street cred you earn. Whether they’re sloppy and go all the way down to your knees or balloon up to impossible proportions, the trick is in carrying them off like you really couldn’t care less. Although autumn is the season for wilting of flowers, the Fall runway this season was peppered with designers who seemed to have other ideas altogether. While some of them, like Emilia Wickstead, limited this penchant to embroidery, Christopher Kane threw caution to the wind and stuck 3D sequinned flowers onto his ensembles. 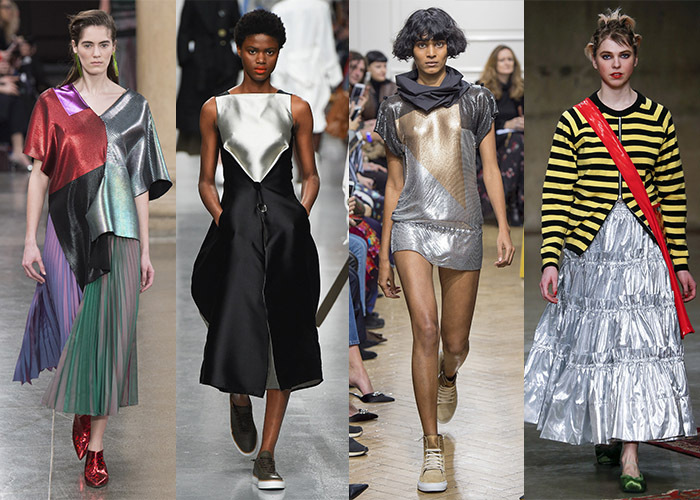 Metallic hints continued to enjoy popularity this season. Adding a chrome patch to an otherwise regular outfit will instantly elevate its wow-factor so long as it is done tastefully, as seen at Eudon Choi. Don’t try to mix too many colours or you could end up looking tacky unless you have a knack for it like Christopher Kane.